The third and final testing wave with students in the JOBSTEM research project is coming to an end. 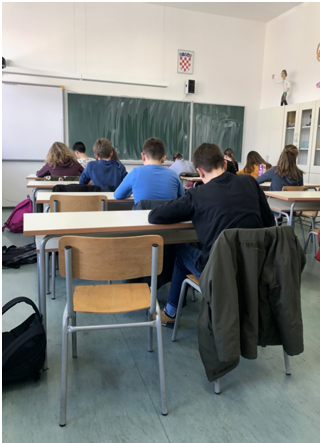 In this wave, students from the 6th, 7th and 8th grades of 16 elementary schools completed the project battery of tests: two classes in each cohort, amounting to 1800 students in total. Testing sessions were organized in two parts, with the first focusing on a JOBSTEM questionnaire about students' self-concept and success expectancies in STEM domains, subjective value of STEM school subjects and interests for careers in STEM, and lasting for 2 periods. The second part included an objective test of students' knowledge in the STEM domains, a general intelligence test, and personality and self-esteem measures. STEM knowledge was assessed in all three cohorts, whereas the intelligence and personality tests were only used with students in the 6th grade. As in the first part, all tests were organized during periods of students' usual lessons, in their classrooms, and were carried out by trained collaborators. The longitudinal data collected through these three research waves will allow us to gain insight into the development and changes of students' STEM aspirations, as well as their achievement and motivational beliefs in the STEM area.